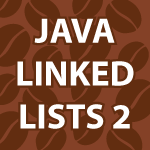 In my previous Linked List in Java tutorial, I showed you how to create Linked Lists and how to manipulate them. In this tutorial, I will cover Double Ended Linked Lists which have a reference to the first and last link. I cover how a Doubly Linked List allows you to go backwards and forwards in a list. Then we take a look at Iterators. Numerous other topics are covered and the code and video below will help you learn. I think that the insertAfterKey method needs to check the double link is not empty.